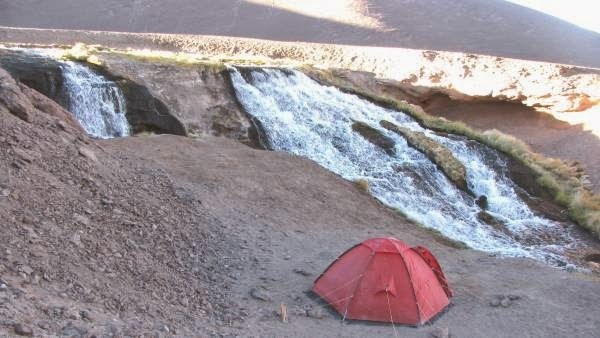 Note: This is the fifth in a 31-part posting of my journal entries and photos from one of the greatest experiences of my life so far--a month-long mountain climbing trip to the Atacama Desert area of northern Chile and Argentina, which included summiting three 6000 meter peaks (~20,000 feet). To view all the entries in this series, check the posts labeled South America. 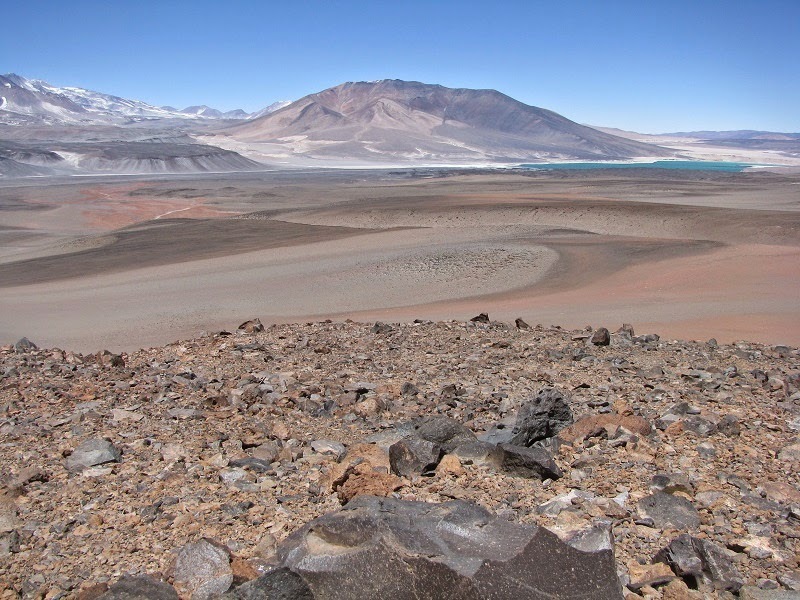 Looking west from about 16,500 feet elevation toward Laguna Verde and the desolate, nearly lunar landscape of the high Atacama Desert. 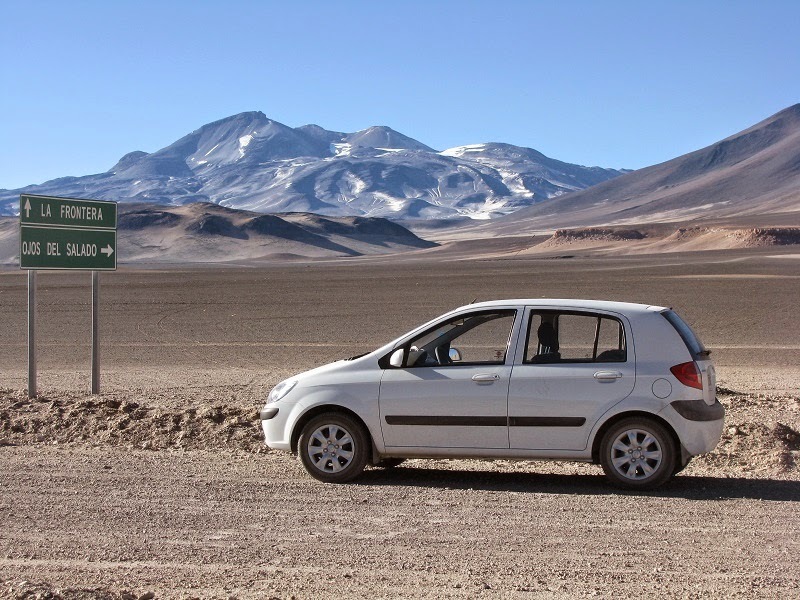 I was parked on a pull out beside the road at about 14,000 feet elevation and slept in the car overnight. One last car came by at about 9:25, then I had the place entirely to myself for the duration of the night. I was pleasantly surprised at how well I slept, getting big chunks of intermittent sleep all through the hours of darkness. At first I was too warm in the sleeping bag and had to unzip it. I also went outside and refilled my water bottle and appreciated the chance to cool off! But it continued to get colder all night, and I was soon perfectly comfortable snuggled in the cocoon of the sleeping bag. The reclined seat was much more comfortable than an airline seat, and I had several good positions to sleep in that were entirely satisfactory. Regarding adjusting to the altitude, I had a headache at first, but I took two Ibuprofin and also fully hydrated. I’m convinced from tonight and from my experiences in Bolivia that complete hydration is the real key to feeling good at altitude--it made a huge difference last night. My headache had faded into insignificance within half an hour of hydrating and remained so, returning somewhat in the morning, probably due to further need of hydration. Overnight I marveled at the amazing sky just bristling and swathed with drifts of stars. The waning moon came up over the adjacent hills at 4:20AM and then the sky began to show the first signs of light from the sun around 5:50. I lingered until there was enough light to see easily, poking my arms and head out of the sleeping bag at 6:20. I started the car to heat up the interior, then got out the laptop and caught up on my journal. As I did a truck came by at 6:35--first vehicle since 9:25 last night. By then the car was beginning to warm up, so I got out of my sleeping bag and checked the outside temperature--it was 23 degrees, so I was glad that my drinking water inside the car had not frozen. At 6:45 the first rays of sun hit the one high peak I could see from my cove. I rearranged things in the car and made a breakfast of concentrated Ovaltine. Because of the low pressure at this altitude, I got an explosive facefull of mix as I unsealed the bulging cover of the jar--got it all over my clothes and some on the car seat as well. I drank all of the mix made of equal parts of Ovaltine and a one quart package of powdered milk, mixed with water to make 28 ounces. Then I hit the road at 7:20, as the sunshine was rapidly beginning to arrive on the local hills right around me. Almost immediately I had to stop to take a photo of a cataract on the Rio Lama that has a road leading to it and where someone was camped--a spot I would have taken if I had known about it. 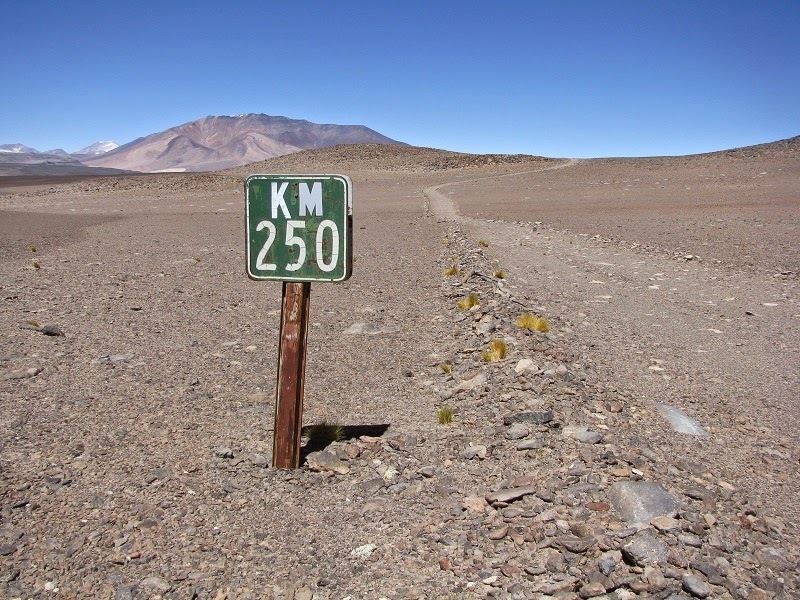 At 22,615 feet, Ojos del Salado is the second highest mountain outside of the Himalayas, surpassed by only Aconcagua, another mountain farther south on the Chile-Argentina border. The expedition I was to join later was planning to summit Ojos. That was the reason I had come to South America. I drove on west and got to the high lake called Laguna Verde (Green Lake). In the photo below you can see the quality of the highway surface here--pretty basic, very dusty! 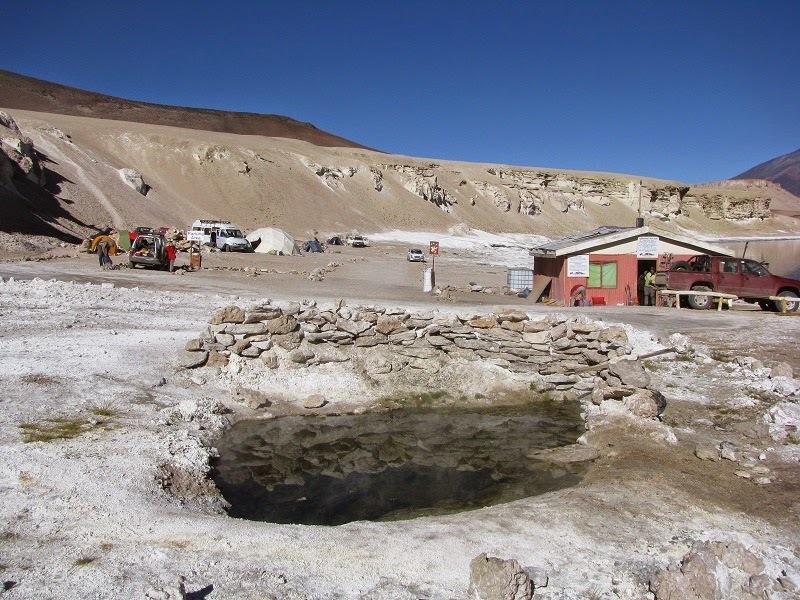 The Aventurismo organization has their field office here where some hot springs drain into the lake. I “checked in” at the refugio - the building has a hot spring bath/pool inside - and looked over the perfectly warm little hot springs pools outside. But I had no interest in staying. I wanted to do a little hiking today to further acclimatize to the altitude. 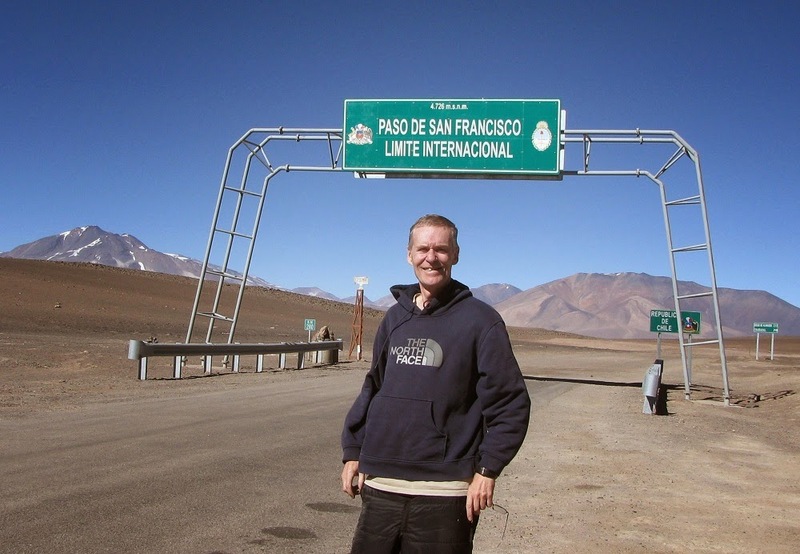 I was there at the refugio only from 9AM to 9:20 then moved on, headed for Paso San Francisco and the Argentine border. I got to the border at 10AM and took a few pics of myself. The sign lists the altitude at 15,505 feet and my watch altimiter read 14,880 feet, so I reset it. It turns out that the altitude that I slept at last night was the same as the altitude of Laguna Verde, but I’m glad I stayed where I did. At Paso San Francisco, my gas gauge read 5/8 full, so I’m cutting it pretty close (to make it back to the closest gas station in Copiapó), assuming that the gauge is skewed as most are--probably only have half a tank left, so I added the 10 liters of gas from the gas can I brought along to see how the gauge would change. It went up to more than 7/8 full--a quarter tank, which was in accord with my rough estimate of a 40 liter fuel tank. That was all the gas I had to play with until I got back to civilization. 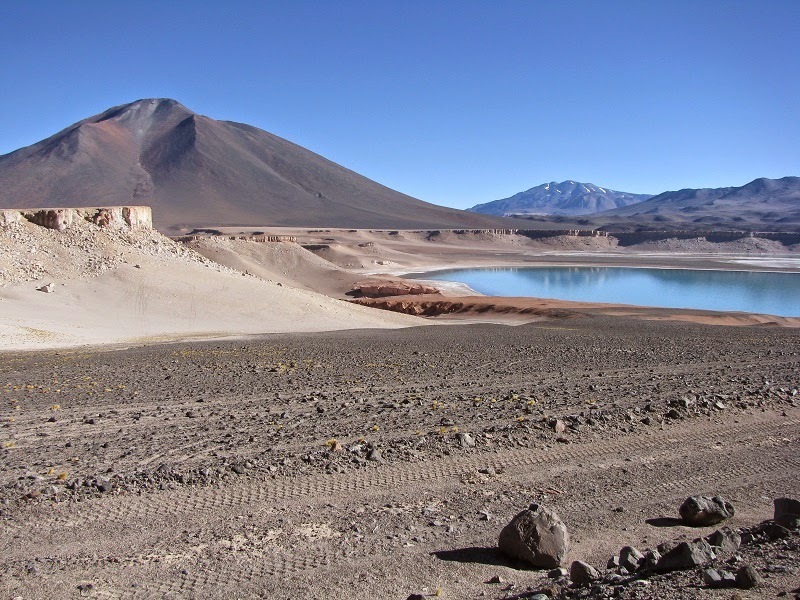 At 10:25 I headed back down into Chile Laguna Verde. I stopped again at a turn-out just below the pass at 15,080 feet, considering whether to spend the night this high, and also interested in trekking around on a mountain off to the north. So I shut down the laptop and the car, put on sunscreen and trekking shoes and headed out around 10:45. I had no plan at the outset, other than hoping to reach an altitude of 16,500 feet today. I found a 250km marker on the old original abandoned one lane road. Then I started trekking toward higher ground. The wind was fierce and getting fiercer. I got to the top of a mound that was almost exactly 16,000 feet and was almost physically blown off it--gusts well over 50mph for sure and steady winds of 40. Luckily I had brought along extra jackets and mittens--I put on a lot of stuff and was warm in the wind, but needed 4 layers or so to be comfortable even though the air temperature was in the 60’s. I started heading across gentle slopes toward a fairly significant mountain north of the road, but set back a couple of miles, targeting a little snow field in a valley (out of the wind?) that looked to be at about 16,500 feet. Somewhere along this section I paused to shoot the photo headlining this post. At this point in my adjustment to altitude, I could not imagine how I could get another 5500 feet higher (to the summit of Ojos del Salado) unless I could do it in small increments and very slowly. At this point I just have my eye on achieving 20,000 feet. I started down at 2:30PM, going a direct bee-line route toward my car. The way back was more into the wind and was on the windward side of the spur of the mountain (probably about an 18,000 foot mountain) so the wind was truly brutal. Plus I had no idea how far I had traveled horizontally. I do remember looking at these mountains on Google Maps and not even considering climbing them because they were too far from the road!! Anyhow, the return walk was serious torture. I got back to the car at 4PM, implying that the horizontal distance was probably more than four miles and vertical ascent 2000 feet. I was really spent but so happy to be out of the wind. I found myself continuing to need to consciously breathe heavily. I considered the possibility that if I re-hydrated fully and got a balance of calories in my system that I might get rid of that desperate need of oxygen. The reason I suspected that was because even near sea level on my training hikes of Bob's Hill in MD I noticed the same effect on days when I had not taken in enough calories. It worked exquisitely. I ate crackers, a packet of Gu, plenty of water, and some Skittles, and soon all need of consciously breathing heavily disappeared completely, only to come back a little about 3 hours later when I was needing more food and water. All in all, today provided a bunch of hugely valuable ‘data’ and lessons on my body's reaction to altitude. Once I had eaten I just reclined in the seat and rested and napped for the rest of the afternoon, not stirring into action again until around 8:00 as the sun was setting below Mulas Muertas. The wind seemed to begin to let up just as the sun set. I wonder if today is typical. This morning as I drove past Tres Cruces, it was absolutely dead calm out in the wide open flats between mountains. Even at San Francisco Pass the wind was only a moderate breeze. Only in the afternoon did it get so fierce. I’ve read that people start summit days early here mostly to avoid the wind. I guess I’ve just had a firsthand lesson in why that’s a wise move. In the days ahead I’ll try to be aware of the cycle of the winds. I’ll probably only do one more hard workout like today’s five hour ordeal before I leave--probably try to get to 18,000 feet on Mulas Muertas starting at 14,000 feet at Laguna Verde. That mountain is over 19,000 feet high and people do that 5000 foot ascent as a ‘little’ training hike! I think I must be a true pretender in this area of endeavor. I had caught up on my journal writing a bit after sunset, at 8:40, then I turned on the car for a while and continued on the laptop, processing the panoramas and other photos taken today. It looked like I’d have almost no road traffic again today, going by my little turn-out. It had already been something more than an hour since the last vehicle passed. I finished the photo work at 9:25 and turned off the car and settled in for the night.